Thomas is the complete Furniture Solution from Design to Installation, and all the components in between. Work with our highly trained designers who are knowledgeable in the sciences coupled with craftspeople dedicated to building first in class laboratories. Benches: self-supported, modular benches designed to incorporate either suspended casework or traditional floor-mounted casework. 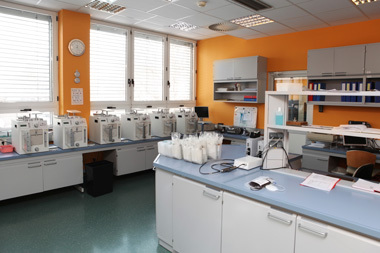 Any lab countertop can be used with these systems. Many built-in accessories are available. All systems are custom-designed around the customer's specific needs. Cabinets: available in 10 standard colors or custom colors upon request. Cabinets have optional hinged or sliding doors that are available in solid or glass. Countertops (add info: Available in epoxy resin, phenolic core, stainless steel, and plastic laminate. For a customized consultation and quote, click HERE to fill out the request form, contact your Thomas Scientific sales representative or call 1-800-345-2100. Our program offers an excellent selection of painted steel, stainless steel cabinets, HDPE cabinets and high quality wood laboratory cabinets. We also have a comprehensive offering of chemical fume hoods, biological safey cabinets, flexible lab furniture, healthcare furnishings and work surfaces. Click HERE to view our chair selection and to build your own chair (will launch in a new window). The Treston 3D Design tool allows you to design and build your own customized workstation from frame to accessories. You can see the workstation take form on your screen, and are able to submit it directly to us for a quote upon completion. Click HERE to launch the configurator (will launch in a new window).